iTero® Element™ is the most advanced intraoral scanner available on the market. It is the most precise and comfortable way to take an impression of your teeth, whether it’s for Invisalign treatment or traditional braces. This eliminates the need for most messy tray and putty impressions. The iTero® Element™ scans at a rate 20x faster than the last generation of iTero® scanners, with a wand that is 40% smaller. This means your digital impressions are faster and more comfortable than ever. Taking Invisalign impressions has never been easier! 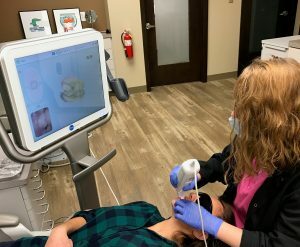 Advanced Center for Orthodontics is proud to introduce digital scanning to our practice with the next generation of iTero scanners.